Sushi is the Japanese cuisine that has taken over the world. 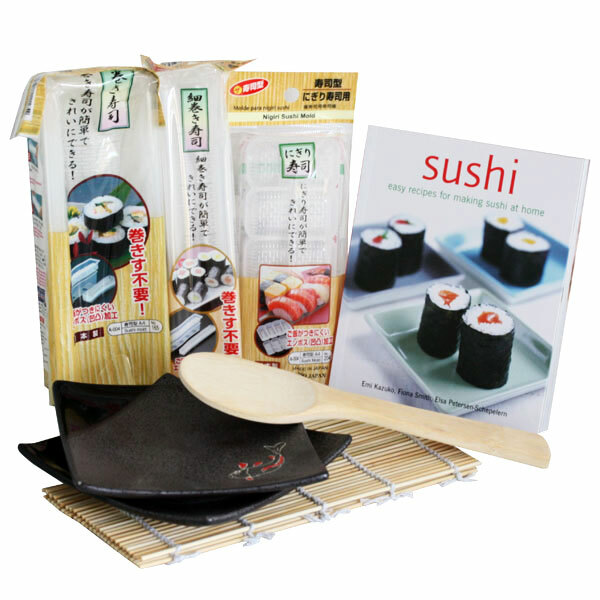 Our Master Sushi hamper contains our specially designed Sushi Tool Kit and Sushi cookbook that will have you rustling up rice and slicing sashimi in no time at all. You’ll have all the tools at your disposal to become a sushi legend! Japan Centre fans from all over the world* can enter this cracking competition. 1. What Christmassy topping would you put on top of your sushi? Comment your answer on the blog post below. Tweet your answer to @JapanCentre on Twitter using #hampertastic (make sure to follow us so we can DM you). Write your answer on our corresponding Facebook post mentioning this competition. We will choose 1 winner at random on Friday 4th of December. Go forth and enter Japan Centre fans! Best of luck! ANOTHER ASTONISHING HAMPER UP FOR GRABS NEXT WEEK- keep your peepers peeled kids. 1) *Week 1 – Master Sushi hamper winners may have delivery addresses in any country to which JapanCentre.com ships. 2) Japan Centre will choose a winner at random after the closing dates at midnight on Thursday 4th December, Thursday 11th December, and Thursday 18th December. If no response is received from the selected winner within 7 days a new winner will be chosen from runners-up. Posted in Uncategorized and tagged christmas, christmas f:east, competition. Bookmark the permalink. Cucumber cut in the shape of holly. I’d go with marinated eel, for the tradition. Hmm red green and white are Christmas colours….so maybe a nigiri sushi: red tuna with green cress on the white rice? I’d go with lightly seared venision, with a bit of wasabi mayo for a twist- Deer is always traditional for us at christmas! Nori (seaweed) cut into holly leaf shapes with ikura (salmon caviar) for the berries! Green pepper in the shape of a Christmas tree! Either that, or I’d make a KFC-style sushi roll…after all, fried chicken is the most commonly eaten Christmas meal in Japan! A bit of chesnut stuffing! That would work… right? I think thinly shredded raw brussel sprouts would taste amazing! I would put some roast pork on my sushi with a sprinkling of crushed roasted chestnuts and a drizzle of delicious gravy! I would definitely choose lobster as a Christmas sushi topping! Smoked mackerel – love it. Fried seedweed and salmon skin! Cooked sliced reindeer, with pork in the middle and rice on the outside wrapped in bacon. Dipped with cranberry sauce. Roasted chestnut could maybe work! Smoked Salmon with a touch of wasabi – nom!